I recently bought a 1948 Willys CJ-2A Jeep only to learn the transmission had been obliterated by severe corrosion. I was convinced that this budget off-road project was dead in the water, as parts for that gearbox were prohibitively expensive. Then I completely rebuilt the trans in one night for less than $100. Here’s how. The entire purpose of this project was to build a Jeep on a budget, and to show that you don’t need lots of cash to go off-roading with the big boys in Moab, just like I did last year with my $600 XJ. But new gears for the CJ’s trans would cost between $50 and $150 a piece, and buying an entire transmission worth would put me in the poor house. I knew there was only one hope to keep this budget Willys project alive: I had to beg. 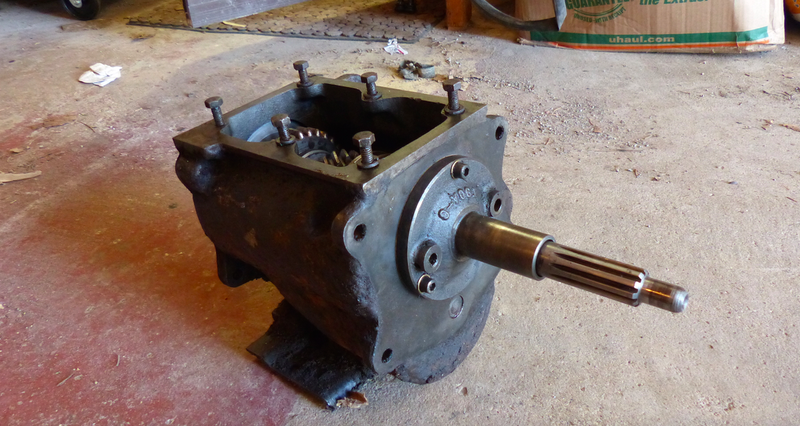 Today I disassembled the transmission and transfer case from my new 1948 CJ2A project. Unfortunately, water found it’s way into both gear boxes. As a result, most of the gear teeth have significant pitting. That being said I’m looking for some good used replacement gears for the transmission (T90) and transfer case (Model 18). Please let me know if you have any! I figured that, between the people on that messaging board, and readers who might have seen my toasted transmission, eventually I’d find someone who had a T-90 sitting around that their spouse has been nagging them to get rid of. I was right. Within moments, I had messages in my inbox from people with oodles of spare old Willys transmissions sitting around gathering dust. And also rust, apparently. One guy named Joe told me he had eight T-90 transmissions, and that he’d crack into them soon to see if he could find good parts to sell to me for cheap. After a few days, he found that seven of his eight T-90s were toast (see pictures below), and that the last one he was, understandably, going to save as a spare for his own Jeep. Dammit. Shortly thereafter, I got a message from another guy, asking me to call him, as he had a bunch of old Willys transmission parts at what I concluded was a giant warehouse. I gave him the exact details of my Jeep and the trans, and he went off to search, telling me he’d call me back the next day if he found a set of nice gears. I never did hear back. I began to wonder if most of these ancient transmissions had met the same fate as mine, as the Jeeps have no roofs to keep water from sneaking into the top of the transmission housing, whose shifter boot tends to crack over time. But before I lost all hope, I got an email from a reader named Etienne out of Quebec city. He said he had a Ford GPW, and that he planned to restore it and put the original T-84 back in, replacing the T-90 now bolted to the Jeep’s Go-Devil engine. In other words, he had a trans he no longer needed. So he sent me a whole slew of close-up pics (the picture at the top of this section shows all the gears in a plastic box), all of which showed gear teeth that were way, way nicer than mine. They weren’t perfect—there was some light and moderate pitting here and there— but these gears looked promising. I sent Etienne $40 over PayPal to cover shipping, and he mailed an entire transmission worth of gears to me via the Canada post. That was it, he didn’t want any money—he just wanted to help me out. I owe him tremendously. Jeep people are the best. So in the span of a week, I went from optimistic, to crushed when I saw the state of my gears. Then back to optimistic when I got emails from people wanting to help out. Then back to crushed when everyone’s gears were toast. And finally, through the grace of the Jeep gods and through legendary Canadian kindness, my CJ-2A project was back on track. When the gears arrived, they looked much better than my old ones. So now, all I had to do was buy a rebuild kit—which included bearings and gaskets—for $57, and it was time to get this thing back together. My friend Brandon came over after work, and we set out to get this thing rebuilt that night, as I was heading to Germany the next day, and a half-rebuilt transmission waiting for me at my house would drive me insane. Our setup wasn’t exactly a pristine, sterilized work environment; it was just a couple boxes laid out on a driveway, illuminated by a shop light hanging from an engine stand, and with a laptop playing a ridiculously dry but helpful T-90 rebuild how-to video. Since we had already gutted the gearbox, now it was time to put it back together. Should be easy, right? The first thing we did was clean the outside of the case, which was covered in 70 years worth of thick, hard goo. Next, we installed four layers of 22 needle bearings into either side of a spacer in the center of the cluster gear, a spacer which we had pressed in with a spare from my old cluster. To get the needle bearings in a perfect circle without them falling all over the place, we lathered them with Red “N” Tacky, the stickiest grease known to humankind. We inserted all four layers, praying that the Jesus-grease would hold and not pour little hard metal cylinders all over my driveway. Next, we placed the reverse/idler gear. Then we banged its shaft through. Note that we didn’t need to put roller bearings into the reverse idler because it’s got a brass bushing inside, whereas the cluster gear does not. Next, we placed in an oil collector just around the outside of the cluster. The oil collector is there to direct oil in a way that allows good lubrication of the input bearing. Speaking of which, the next step involved placing an oil slinger (it works in concert with the oil collector to lubricate the bearing) onto the transmission input shaft, and pressing on the input shaft bearing. And by “pressed,” I really mean we used a hammer and the old bearing to slam that sucker onto the input shaft, which we had frozen so that thermal contraction could work its magic. As soon as the oil slinger and bearing were on the input shaft, we threw a snap ring on, and banged that input shaft bearing into the transmission case. Now that the input shaft was in place, we carefully adjusted the cluster gear so that it was lined up with the input gear on the input shaft. Then we slid the counter shaft (a big, smooth steel rod) into the cluster gear, carefully so as to go right through the circles of needle bearings (the cluster’s needle bearings ride on this counter shaft). Next, after throwing some bolts into that oil collector we had loosely placed earlier, we placed a bunch of needle bearings into the input shaft so that it could receive the output shaft. But first, before we could shove the output shaft into the input shaft, we had to prep the former. So we assembled the synchro clutch hub with synchro springs and plates. And eventually got the whole thing put together, and retained it all with a snap-ring. After fiddling with the synchro clutch sleeve, we slid the tip of the output shaft into the roller bearings in the input shaft. Then we pressed a bearing plate into the transmission case , and gently slid the output shaft bearing over the output shaft (it will be pressed onto the shaft when we bolt the transfer case to the transmission). We then fastened the input shaft bearing retainer with a new gasket and a felt washer from the rebuild kit. Finally we tapped in a lock plate meant to keep the counter shaft (which the cluster rides on) and first/reverse idler shaft from rotating. It’s actually a fairly clever method of preventing two shafts from rotating: cut notches in both of them, and shove a rectangular plate in the notches. And with that, all was right with the world. It is worth noting that we had to redo this process three or four times, and the whole ordeal probably took about five hours. We usually got three-quarters of the way done only to realize we couldn’t fit the oil collector now that the counter shaft was in place, or that we couldn’t fit the input shaft into the case without pulling the counter shaft—frustrating stuff like that. It was a five hour marathon, but Brandon and I (well, mostly Brandon, if I’m honest) got it done. We had rebuilt a transmission in a single night for less than 100 smackers. What’s Next For The CJ? My newly rebuilt trans now sits on the shelf awaiting installation. Out in my driveway, my CJ-2A still sits with its engine supported by a stack of bricks—a sight with which I’m sure my neighbors are positively thrilled. The next step is to pull the old Go Devil engine and give it a good once-over. Though it currently does run and doesn’t seem to smoke, I ran a compression test and got only 60psi in each cylinder— the lowest number I have ever even heard of on a running engine. I’m honestly not even sure how it’s possible that the thing runs. We’ll see what’s going on when I get the motor on the stand. So while I might have gotten lucky with my trans by the grace of a kind Canadian and a friend who can rebuild CJ-2A transmissions in his sleep, I’m not in the clear yet. Who knows what horrors lurk inside that 70 year-old little four-cylinder.